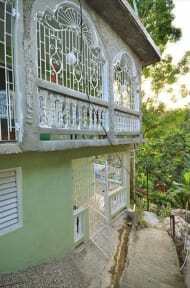 Tru Ites Guesthouse kohteessa Montego Bay, Jamaika: Varaa nyt! 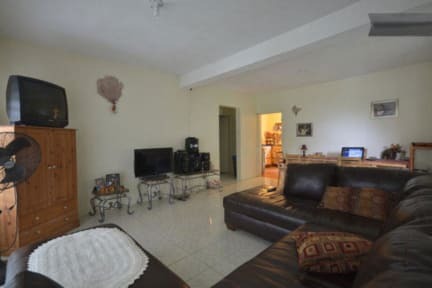 With the assistance of the charismatic and hospitable owner Billy you can connect to any side/aspect of Jamaica that you wish to see. No guest leaves without a great experience staying at Irie Ites Guesthouse. Come and see the real Jamaica. Please note that this is a guesthouse located in a real neighborhood. There are shops, churches, music, schools and the vibz the of island and it's people. One of the rooms has two rooms each with a double bed and can sleep one to four persons, full kitchen and bathroom. It has a veranda with a private grilled entrance. All windows are screened and grilled. Your safety is important to us. TV and wireless internet in your room. Hot water, room fans and phone service to the US and CA. The second room is a large room furnished with one double bed or can furnished with an additional bed upon request. It can sleep 1-4 persons. It has a private bath and entrance with screened windows and grills. This unit has a microwave and small refrigerator. TV and wireless internet in your room. Hot water, room fans and free calls to the US and CA.